Rugby union betting is still in its relative infancy, unlike other sports such as soccer or tennis there is a fairly limited number of markets available to bet on. This is likely to change in the near future as the popularity of rugby grows. Having said that, there is still plenty of fun to be had and money to be made, and enough markets to keep you interested. In this guide we will explore some of the markets that are available and explain exactly how they work. Tournament or competition betting is probably the simplest area of rugby union betting. Tournament betting is the area of rugby betting that allows you to place bets on the outcome of a tournament such as the Six Nations or Rugby World Cup, or place a bet on the outcome of a season long competition such as the Aviva Premiership or the Guinness Pro12. There are very few markets available, with a slight variation depending on the structure of the tournament in question. 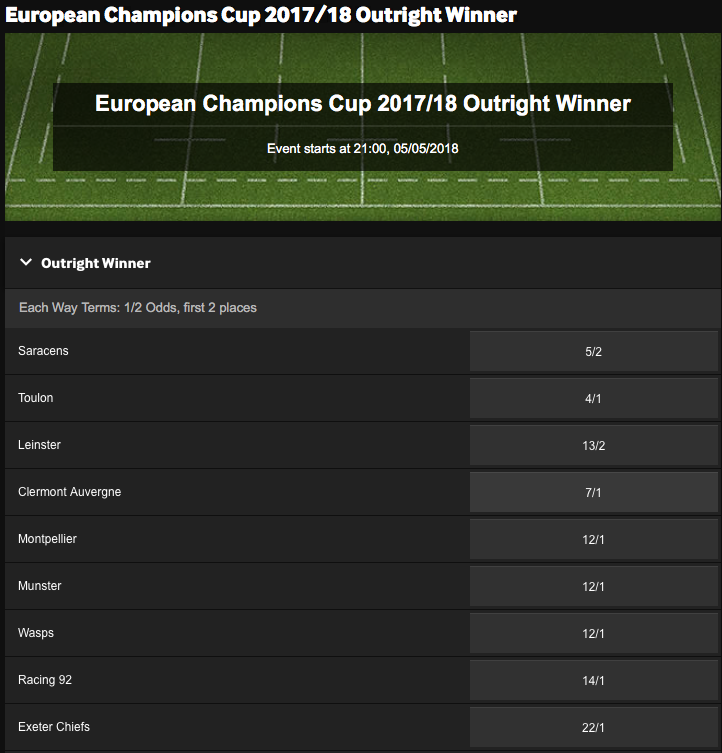 Below we will look at each of the most popular European rugby union competitions and the tournament betting markets that are available in each. The Six Nations is an annual competition that is played between Europe’s leading international rugby teams. As the name suggests six teams contest the competition; England, France, Ireland, Italy, Scotland and Wales. At present there is no relegation from the tournament, although there is increasing pressure to introduce this. There are four key markets on which you can place your money during the Six Nations. The tournament outright market allows you to choose the team that you think will finish the tournament at the top of the table. It is possible for a team to win the tournament outright without winning all of their matches. Since 2000, England has been the outright tournament winners on six occasions, France has won five, Wales has four victories and Ireland three. Scotland and Italy have yet to win the competition. The Grand Slam winner is the team that not only wins the Six Nations competition, but does so by winning all of their respective matches. Since the competition’s conception in 2000, there have been nine grand slam winners from the 18 competitions. It’s also worth noting that no team has completed the grand slam in back to back seasons. The Triple Crown is a trophy that is competed for by the ‘home nations’ England, Ireland, Scotland and Wales within the Six Nations competition. The Triple Crown is only awarded if a team beats all three of their home nation opponents during the Six Nations. It is possible for a team to win the Triple Crown without winning the Grand Slam or the tournament outright. Don’t be fooled, when placing a bet on the winner of The Wooden Spoon you are in fact placing a bet on the team that you think will finish at the bottom of the Six Nations table. Since joining the competition in 2000, Italy has finished at the foot of the table on 12 occasions. Scotland has finished last on four occasions whilst Wales and France have propped up the table once each. England and Ireland have never suffered the indignity of finishing at the bottom of the pile. As with the Six Nations, placing a bet on the tournament outright is choosing who you think will win the competition. Unlike the Six Nations, most bookies will allow you to place your bet each way. This means that if the team you choose as the outright winner reaches the final, but finishes as runners up, then you will win the bet. Most bookies will pay a third of the odds for an each way bet win. The first European Champions Cup competition (then called the Heineken Cup) was held in the 1995-96 season and since then there have been 11 different winners. French club Toulouse has won the competition on four occasions, more than any other club, and has also finished as runners up on two occasions. Toulon are second on the list with three competition wins which came in consecutive seasons between 2013 and 2015, while Irish club Leinster has also won the competition on three occasions. The European Champions Cup is made up of five pools each made up of four teams. Each of the teams in the group plays one another on a home and away basis, meaning that each team will play a total of six games in their pool. Following the completion of the pool stages the five pool winners and three best runners up qualify for the quarter finals of the competition. The pool winners market allows you to place a bet on the team that you think will finish top of any given pool. This is an extremely difficult market to predict given the competitive nature of the European Champions Cup. The Aviva Premiership is England’s premier club rugby competition. The current format of the competition sees England’s 12 leading clubs compete on a home and away basis over the course of a season. At the end of the season the top four teams in the standings qualify for the semi-finals of the play-offs. The team that finished top of the standings plays the team that finished fourth, whilst the second and third place teams face one another. The winners of the play-off semi-finals compete against one another in a grand final to determine the champions. Since the play-off system was introduced in the 2002-2003 season only four teams have finished at the top of the table at the end of the regular season and gone on to be crowned grand-final champions. 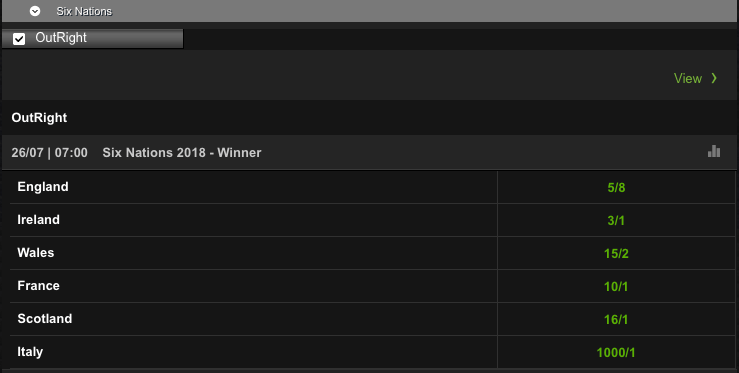 Placing a bet on the regular season outright allows you to bet on the team that you think will finish at the top of the table after 22 matches, before the teams enter the play offs. Since the introduction of the play-offs, Leicester Tigers have finished on top of the table at the end of the regular season on four occasions, more than any other team. Saracens and Gloucester have both finished in first place on three occasions each, while Bath, Sale Sharks, Harlequins, Northampton Saints and Wasps have all finished in the top spot once each. Most bookies will allow you to place bets each-way paying out a third of the odds if your chosen team finishes as runners up in the regular season. Betting on the grand-final winner, allows you to put money on the team that you think will be crowned as champions following the play-offs. London Wasps and Leicester Tigers have been crowned as champions on four occasions each since the introduction of the play-offs, while Saracens has won the title on three occasions. Exeter Chiefs, Northampton Saints, Harlequins and Sale Sharks have all been crowned champions once each. The Pro12 is contested by four teams from Ireland, four teams from Wales, two from Scotland and two from Italy. At the time of writing the Pro12 takes on the same form as the Aviva Premiership. Each team plays one another on a home and away basis, with the top four teams entering into a play-off to determine the team that is crowned the Pro12 Champions. The league took its current format in the 2010-11 season. In the seven seasons to date there have been six different winners of the competition. At the time of writing there are strong suggestions in the media that the format of the Pro12 will change for the start of the 2017-18 season. It is likely that the two teams from South Africa, The Cheetahs and the Southern Kings, will join the league having been cut from the Southern Hemisphere’s Super Rugby competition. It is rumoured that the structure of the Pro12 will change to have two conferences, though nothing has been confirmed officially. This is likely to change the betting markets available. The Grand-Final Winner is the most common market available to those looking to bet on the outcome of the Pro12. Most bookies will allow you to place an each-way bet on your selection, commonly paying one third of the odds if your team finishes as grand-final runners up. Leinster are the only team to have won the grand-final on more than one occasion since play-offs were introduced. Match betting allows you to place bets on the outcomes of individual matches. There are more match betting markets available than tournament markets, although the markets are not as developed as those found in soccer. The most common markets available to punters are match outcome, handicap, winning margin, try scorers, first scoring method, and man of the match. 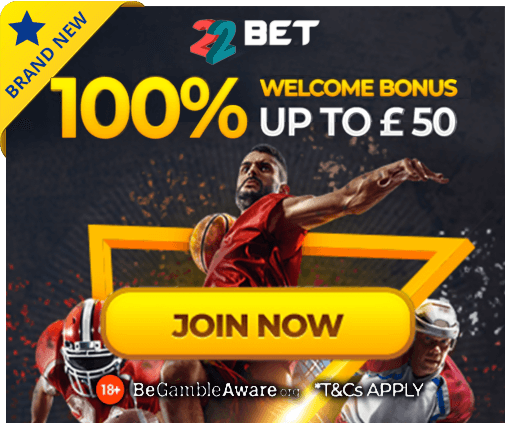 For big matches such as the Six Nations, occasionally additional markets can become available – including exact score markets. This is the most straightforward rugby betting market available. The market allows you to place a bet on three outcomes, a home win, an away win or a draw. In rugby union it is rare that a match will finish in a draw. Also, in comparison to other sports, underdogs rarely pull off an upset. For this reason, other markets may prove to be more attractive. This is a popular betting market in rugby union. It allows the gambler to place a bet on the outcome of a match but also allows for a margin of error. Bookies will provide a points handicap for a team, this can be positive or negative, and at the end of the game the handicap is added or subtracted from the team’s final score, whatever the outcome of the bet after the addition of the handicap provides the final result. For example, if you place a handicap bet on Wales (to win) who are assigned a (+11) handicap in a game against France, and the match ends 23-13 to France, you would still win the bet as the handicap of 11 points would be added to Wales’ score. As there is such a wide variety of potential outcomes to a rugby union match, predicting an exact score becomes very difficult. As a result, most bookies don’t offer odds for exact score bets in standard markets. Instead bookies will offer the opportunity to place a bet on the winning margin of a team. Winning margins are offered in ranges (e.g. 1-5 points, 6-10 points etc. ), you will find some attractive odds in this market particularly in matches that feature a team that are heavy favourites. You may find that some bookies offer other winning margin markets such as ‘alternative winning margin’ and ‘7-point winning margin’, these are simply different winning margin ranges. The double result market allows punters to place a bet on the outcome of each half in a combined bet. For example, a double bet that reads Hurricanes-Hurricanes would be a bet on the Hurricanes to be leading at the end of each half. Betting on a comeback, for example Brumbies – Hurricanes (Brumbies to win the first half, but Hurricanes to be winning at full time) often offers attractive odds. Most bookies offer three different try scorer markets, first try scorer, last try scorer and anytime try scorer. The odds offered for the first try scorer of the game and last try scorer of the game tend to be the same, but be careful when betting on these markets. The possibility of a player scoring the first try of the game is better (as long as you know that they are in the starting line-up) as they will be on the field of play at the start of the game. The player may be substituted at any point during the game meaning that they have less chance of scoring the last try of the match. The anytime try scorer market allows you to place a bet on a player to score a try at any point during the match. The odds in this market are a lot shorter than those offered in the first and last try scorer markets. In each of these markets you are able to place a bet on any player from either team’s squad, as well as on a penalty try or for there to be no try scored. It is worth considering betting on penalty tries when one team has a particularly strong scrum, and it is worth considering betting on no try being scored in bad weather as teams are liable to make more mistakes when attacking. First Scoring MethodThe first scoring method market typically offers three different outcomes. You can either place a bet on the first scoring method being a penalty kick, a try or a drop-goal. You can also choose which team will make the first scoring play. In rugby union the most likely first scoring play is a penalty, followed by a try, with the least likely first scoring method being a drop-goal. In major matches you may find that bookies offer odds on the man of the match. The man of the match is typically awarded by pundits of the television broadcaster that is broadcasting the match. So for the Six Nations this would be the BBC or ITV in the UK. When placing bets on the man of the match, there are certain positions that are more likely to be given the award than others. Typically, the outside half (number 10) is considered the playmaker and the player that controls the game. In a team with a dominant forward pack, expect the outside half to pick up the man of the match award. Likewise, in a team that is having to defend for large periods of the match the flankers or number 8 should be considered as good candidates for the man of the match award. These players tend to make a high number of tackles and steal the ball from their opponents, slowing down attacks and generally disrupting play. 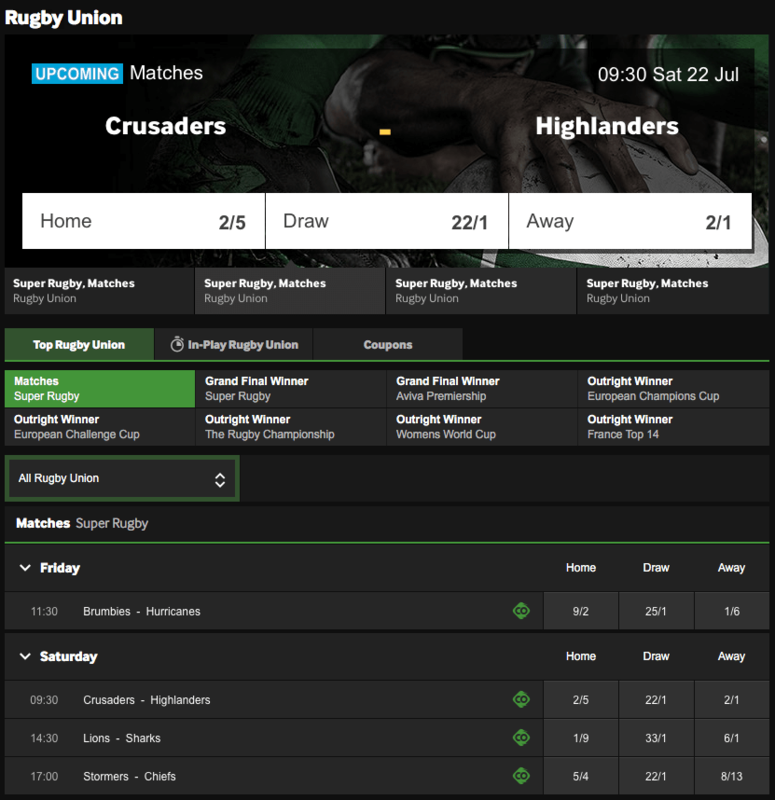 While the above provides a brief guide to the most common betting markets available for rugby union, you may occasionally find additional markets available, particularly when matches are televised. Some markets that you may encounter include Asian Handicap, Half-Time Handicap, Exact Winning Margin and Exact Score. These niche markets tend to offer longer odds, as they offer much rarer outcomes. Accumulator bets are bets that combine a number of different outcomes together in a single bet. To win these bets all outcomes must occur. When betting on rugby union matches you may wish to consider accumulator bets to provide you with longer odds, especially if matches are expected to be one sided. An example of an accumulator bet would be Mauro Itoje to score first try and England to win by 1-5 points.